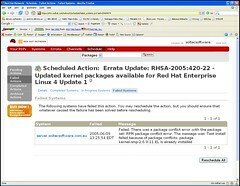 There currently is a bug with Red Hat’s Network and systems aren’t automagically updating their security fixes. I’ve noticed this on a machine I administer. I really expect better from Enterprise products.